What happens when you have this beer that in your mind you've always considered your favorite beer of all time. You keep this beer in your back pocket, not drinking one for a couple years while you develop some beer tasting and rating chops. You buy it in mid-December, pencil it in as your New Year's Eve nightcap, ideally topping off the best beer-drinking year of your life with the best beer of your life. Except do you really want to have your favorite beer--and rate it for the first time--when the ball drops to midnight, after you've had multiple drinks and clouded your overall (not to mention beer-rating) judgment? I guess not. So my long-labeled favorite beer of all time sat in my fridge for a month, until last night. But what happens when your favorite beer of all time is no longer your favorite beer of all time? It is sort of a mindset-altering experience. Even though when I was asked the all-time question, I would always preface Rochefort 8 by saying 'I'm not quite sure it still is, but I've always considered it to be...' And maybe that's why I didn't rate on in 2008. I didn't want to know. Didn't want to have to potentially change my mental rankings. There's a very easy parallel to be drawn between this reluctance and my reluctance to knock clearly inferior, but sentimentally meaningful songs off my all time favorite songs list. Sure, maybe with my keener ear and more mature understanding of music a Get Up Kids emo-ballad doesn't stand up to a TV On the Radio psych-out. Maybe a Grain Belt Premium doesn't have the full-bodied flavor of a Bell's Third Coast Old Ale. But maybe that doesn't matter. Maybe sentimentality still has a place in ratings, and the power of pleasant memories should be included in the final tally. 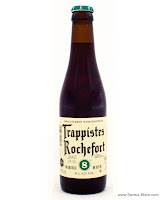 Maybe I can still convince myself that Rochefort Trappistes 8 is my favorite beer of all time. But no, I can't. There are too many good beers out there that just plain taste better to justify putting this one at top simply for poetic reasons. I almost feel like I can't really even rate the beer at this point. I'll try. The first signal I received last night that maybe this wasn't the beer I remembered was its color. It pours a muddy, murky mahogany, so hazy that no light in my house could puncture it. This color of beer usually does not bode well for my taste buds. It smells quite strong, and smells more like adjectives than it does actual identifiable scents: warm, deep, dark. There are definitely some dark fruits in there; figs, cherries, but mostly it smells like it looks. A bit daunting. The fruits come through in the taste, and I can picture a friend of mine sensing a bit of cough syrup in this one. It is highly carbonated, which is a nice way to balance the bold flavor and high alcohol content. If you feel like you're drinking something sparkling, it really can't be that strong, can it? Mixed reviews about the prominence of alcohol, but if I can't taste it outright, I definitely know it's there. The most pleasant characteristic about this beer is the wonderful burn it leaves. It's warming like a cognac, setting your mouth, esophagus and stomach ablaze. A nice second taste in every swallow. After a bottle of this, I wouldn't say you feel refreshed, but you do feel satisfied. Maybe it isn't my favorite beer of all time, that potentially dubious honor now falling to Orval. But this is still a really good beer, and a must-try for anyone looking to broaden their beer palate. And perhaps I'll try another one in a couple years, forget about its old sentimental value, and leapfrog it back to the top.